Léon-Jean-Bazille Perrault was a mid-nineteenth century artist who preoccupied himself with the treatment of subjects that reinforced the affluent bourgeoisie in their desire to have beautiful pictures adorning their homes. Inspired by his teachers, François-Édouard Picot and William-Adolphe Bouguereau, master painters of the academic style of the nineteenth-century, Perrault continued emphasizing mythology and idealization found in their compositions, in his own paintings. In following these two painters, Perrault was also showing his reverence for eighteenth century painters such as Jean-Antoine Watteau and François Boucher who also idealized their subjects. …a polished French gentleman…suave and affable in his manner, tall and vigorous, a serious worker. An extraordinarily rapid talker, his words seem to tumble over each other in their frantic haste to get out…his studio is richly and picturesquely furnished, after the usual luxurious manner of successful Parisian artists. It is, however, nor place of leisure, for Perrault is one of those modern painters who do their ten hours a day of hard work. He was the air of a well-to-do, practical man of the world. 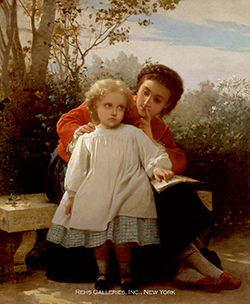 His earliest training was under François-Édouard Picot, but later studied under his friend William-Adolphe Bouguereau. While many highlight the fact that Perrault was a student of Bouguereau, this may have been more so on a basis of their amicable relationship as in the majority of his Salon entries, Perrault lists Picot as his master. Perrault may have worked alongside Bouguereau and been inspired by him, but Picot was his formal teacher. The Second Empire saw the birth or development of what is conveniently called the “painting of style”…The expansion of the intellectual culture, curiosity and emulation developed by the multiplication of the methods of transport, the diffusion of luxury in the environment enriched by the progress of industry and of exchanges, had created for everything that touched art a large clientele, looking more towards delectations of their eyes than to cultivate their minds. Perrault’s images satisfied this public craving for delicate compositions, and they often focused on mythological scenes, but also children, nudes, some genre scenes, and even military scenes. But he found fame with those pictures that showed a delicate and idealized version of life, exactly those pictures which found a large audience. In appealing to the bourgeoisie, Perrault was providing subject matter that was also very popular with Salon jurors. He made his debut at the Salon of 1861 with Le Vieillard et les Trois Jeunes Hommes (The Old Man and the Three Young Men). In 1864 he was given his first recompense for his work, an honorable mention for La Frayeur (The Fright). He also earned a second-class medal in 1876 for St. Jean le Précurseur (Saint John the Precursor) and L’Oracle des Champs; -idylle (The Oracles of the Fields-Idyll). Each of these works appealed to the aesthetic sensibility of the Second Empire public. 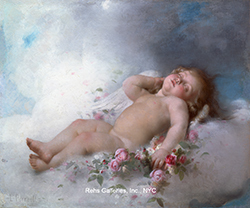 The roots of this sort of sentimental painting of the child are to be found in the late eighteenth century…During the nineteenth century, popular attitudes to children crystallized into various stereotypes: innocence; the microcosm of adulthood; vulnerability; endearing naughtiness. In addition, his focus on children, who he saw as innocent and charming, appealed to the growing cult of childhood that saw children not as miniature adults but as beings with their own characteristics. Perrault continued to exhibit at the Salons until the end of his career. In 1887 he was awarded France’s high honor and named Chevalier de la Legion d’Honneur. At the Expositions Universelles of 1889 and 1900, he received a bronze and silver medal, respectively. He also exhibited in Vienna, London, Boston, and Philadelphia and won numerous medals in these exhibitions, and was later appointed – in 1873 - to represent France as "Diplômât d'honneur" to Vienna, Philadelphia and London. He also became a member of the Société des Artistes Français and by the end of his career was “hors concours” at the Salon, allowing him to exhibit freely without the necessity of submitting work for jury acceptance. 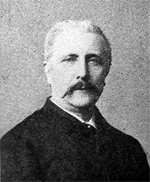 He died in 1908 in Royan. 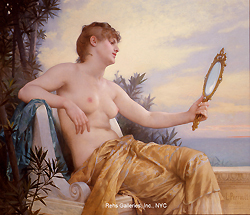 Perrault found a niche for his work in the periods of the Second and Third Republic with his images of unrestrained beauty and decadence, appealing to a public who sought to assuage their wounds from political uprisings and wars which saw France either defeated from within or by an enemy from abroad. For a moment his audience could enjoy a dream-like environment of sheer luxury and elegance. Today examples of Perrault's work can be seen in the museums of Bordeaux, Poitiers, La Rochelle and Stuttgart.